In an appalling incident of theft, a 15-metre-long iron chain, worth Rs 4-5 crore (as per intellectuals), has been found stolen from the 15th-16thcentury old Chakzham Bridge of Arunchal Pradesh‘s Tawang district. The bridge over river Tawang Chu is 25 km from the town and is highly revered for its religious significance. 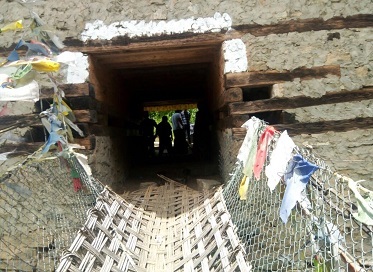 The bridge was built by Tangton Gyalpo, a disciple of 1st Dalai Lama, popularly known as Lama Chag-Zam Wangpo (1385-1464). The bridge that exemplifies finest metallurgy was built over Tawang Chu river during the 15th-16th century, makes a passage through Kitpi and Mukto, both administrative circles of the district. Wangpo who was an architect, philosopher and iron chain bridge builder is credited to have built more than 100 iron bridges all over the Himalayan region. 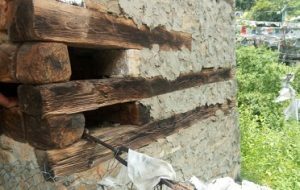 “Approximately 15 metres of the chain has been snapped and stolen,” Leki Tsering, a resident from Mukto village, who had reached the bridge for inspection along with his fellowmen, said. Though the theft came to light onJune 8, however, according to caretakers of the bridge, the thieves are believed to have fled away with the historical artifacts on the night of July 7, 2018. Meanwhile, the Gaon Burhas (village chiefs) and former PRI members of Mukto, Mirba and Gomkyelling have filed a complaint at Jang Police Station. They also wrote to the Deputy Commissioner informing him about the theft. This is not the first instance that the chains have been stolen from the bridge. A similar case of theft was also reported in the year 2015. Lham Tsering, chief editor of a local media house, coupled with Yuva Arunachal president Tsetan Chombay had brought the matter before then Tawang Deputy Commissioner and lodged an FIR at Tawang and Jang Police Stations respectively.